When we're talking about a PC in an AV-room, we are referring to the stationary PC ontop of the lecture podium or conference table. The PC is connected to the cameras in the room, which can be controlled using the Control panel. The PC is also connected to the loudspeakers in the room. The PC is rigged to duplicate its screen the projector/smartboard. 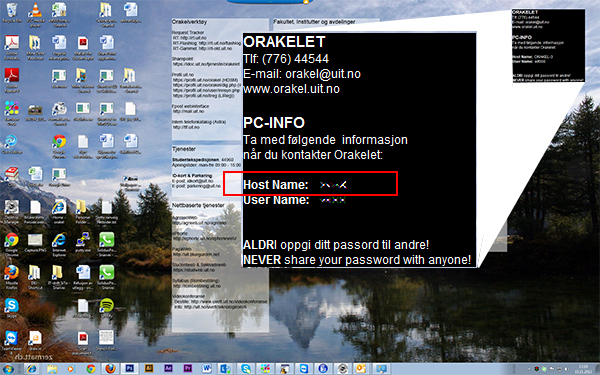 The IT department administers the PC, and it has got its own unique Host-name which lets Orakelet assume remote control of it if needed. Requires login with an UiT-username/password (or an shared account located in the room). All rooms have Crestron Control panels placed in close proximity to the screen, ontop of the lecture forniture/conference table. The panel is touch-enabled. Touch the screen to wake it up, and then press Start. Switch languages: press the British flag for English. Press the (now available) Norwegian flag to switch back again. Log off or Shut down? UiT computers are not meant to be shut down! By Shut down, we refer to the option where you click Shut down in the Windows menu, forcing the neext user to manually turn the computer back on again using the Power On-switch. Shutting down renders the Crestron panel moot, and creates confusion for the next user. Click the Windows-button on your bottom-left side ofthe screen. Find and click the user-account button. Look for the UiT logo. Switch account/Bytt bruker is used when there are multiple users on the same computer who uses separate log-ins. Sign out/Logg av is when you are done and need to finish the meeting, lecture etc. Note: when you Log off Windows, please also shut down the Crestron Panel. This ensures that "the room" is deactivated and ready for the next session. The On/Off-button should only be used in those cases where the PC does not start directly using the Crestron Control Panel. The on/off-switchshould only be used if the PC does not respond when booted using the Crestron Control panel. In new rooms (above picture), the PC on/off-switch is situated at the right side of the screen. 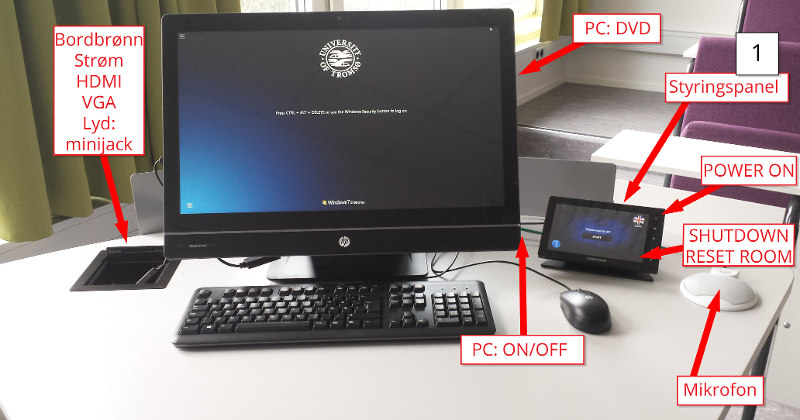 In this example the PC is an All-in-One-model, in which the computer is built into the screen. 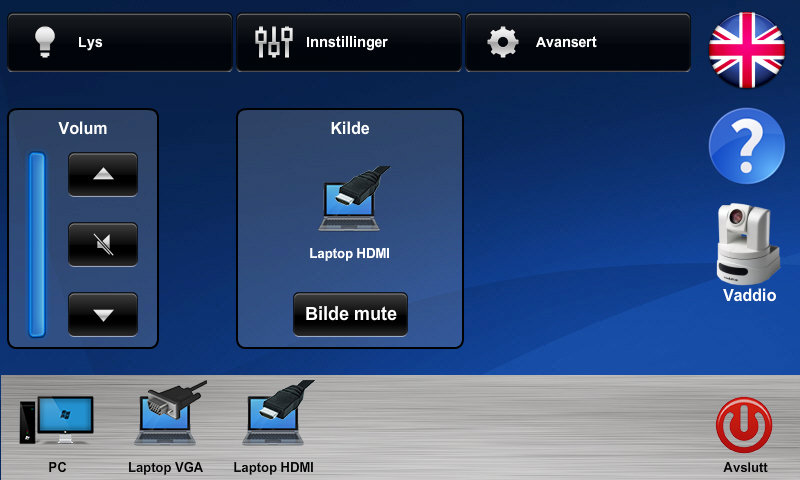 USB-ports will often be located at the left hand side of the screen. Click the Win-key + Pause|Break-key to show Host name. 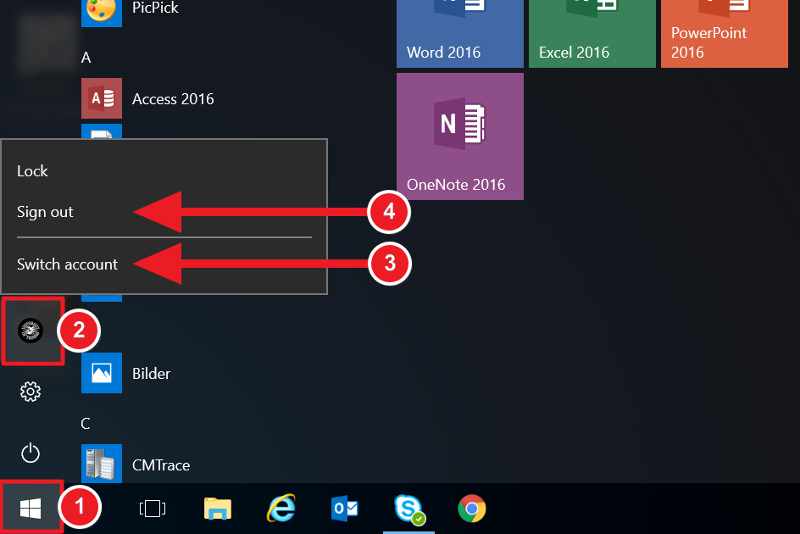 Right-click This PC when you are standing in Windows File Explorer. Select > Properties. View Host name. In Windows 10: click Start > Settings > System > About. View the Host name at the top.